It's a big moment when a hero or villain changes their costume. It represents a turning point for that character - Peter Parker throws his Spider-Man costume in the trash, Daredevil appears for the first time in his red suit on the rooftops above Hell's Kitchen, Carol Danvers takes a new look when she finally embraces the mantle of Captain Marvel. Their new look tells you these characters are larger than life, and we want to let you have that kind of moment in Marvel Puzzle Quest too! On November 26th, we'll be debuting Costumes in Marvel Puzzle Quest. Costumes let you change the way your characters look without changing their powers or stats. Costumes are rare and special - most Costumes will only be available for a limited period of time or only to players who reach particular achievements in the game. We're excited to announce the first Costumes that you'll be able to get on November 26th! First, we heard you liked Deadpool (It's Me, Deadpool! ), so we made a Deadpool Costume for your Deadpool (It's Me, Deadpool!). That's right, Lady Deadpool. If you become a VIP between November 26th and January 3rd, or renew an existing VIP membership, you'll get this Costume. 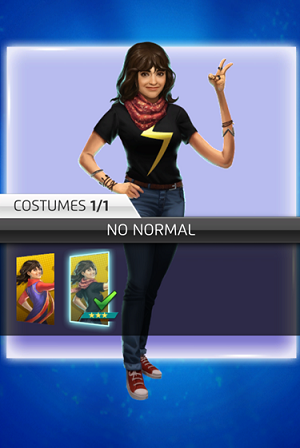 Next up is "No Normal" Kamala Khan. 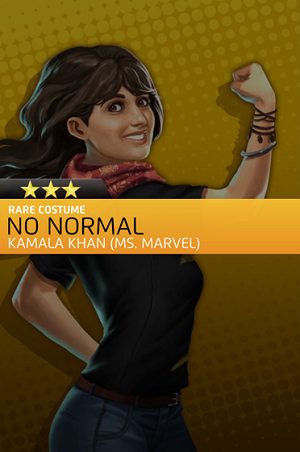 Her "No Normal" Costume, from the comics arc of the same name, will be available in a Heroes for Hire bundle offer running from November 26th to December 2nd. 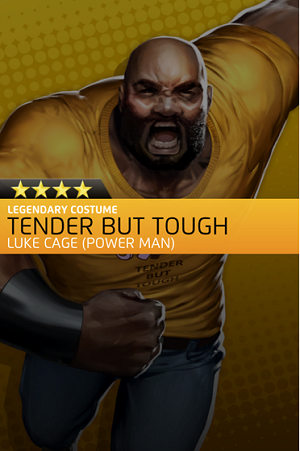 And last, but not least, Luke Cage (Power Man)'s "Tender But Tough" Costume, from Power Man and Iron Fist #7, will be available in the Tender But Tough Vault until November 29th. Costumes change how a character looks, including their animations in battle. Once equipped, the Costume is shown wherever the character is displayed, including to other players in Versus. Costumes don’t change stats or powers. What Costumes are available at launch? Can I equip the Lady Deadpool costume to 4-Star Deadpool, or the Tender but Tough costume to 3-Star Luke Cage? No, Costumes are designed for a specific version of a character. What happens if I get a Costume and I don’t have the character that can wear it? You’ll be able to keep that Costume until you find the character that can wear it. What happens if I have more than one copy of a character? Do I need to find multiple Costumes? No - once you get a Costume, you can use it on any copies of the character you have. How do I get Costumes? 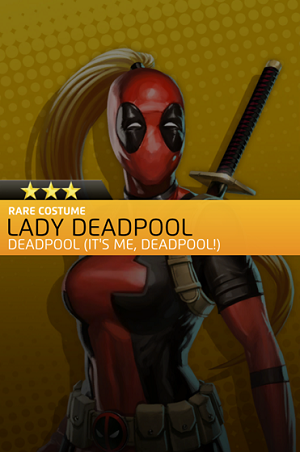 Lady Deadpool is a VIP reward for players who purchase or renew VIP any time between November 26th and January 3rd. The Costume replaces the 1000 Iso-8 day 1 reward (and that 1000 Iso-8 is spread out to increase other Iso-8 rewards). 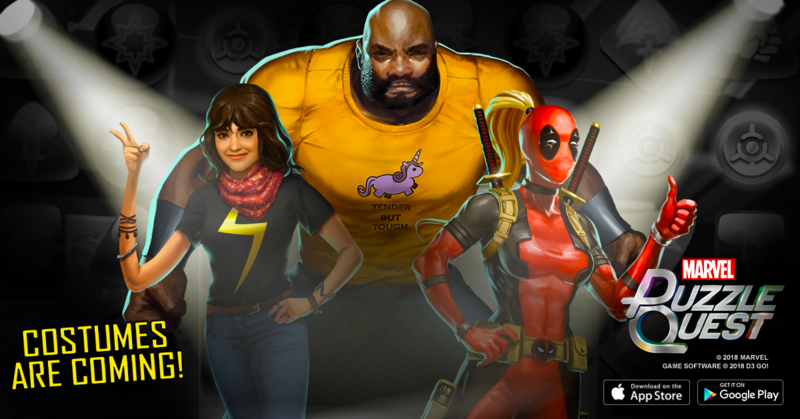 No Normal will be available in a Heroes for Hire offer until December 2nd. 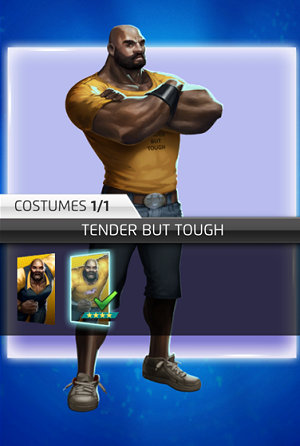 Tender but Tough will be available in the Tender but Tough Vault until November 29th. Future Costumes will be announced in-game when they are available. How do you equip Costumes? You can change what Costume a character is wearing in the character details screens, following their power details and before their bio. What happens if you receive a costume you already have? Duplicate Costumes break down into Hero Points. 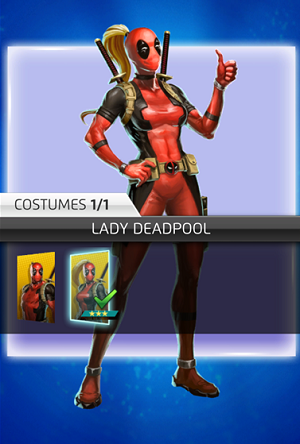 Lady Deadpool and No Normal become 500 Hero Points and Tender But Tough becomes 1,000 Hero Points. We hope you enjoy these Costumes! Let us know what you'd like to see next!